This article is a summary of some of the many things I’ve learned since getting into Moodle development in a more or less serious way. It may be of use to others starting down this path. This last year I published my first Moodle plugin to the database and I’m deep into my second. I’m still not a fully-fledged developer but I do understand a lot more than before. So much so that I’m helping to facilitate a MoodleBites course in the subject . Stuart at HRDNZ knew that I was interested and offered me a place on Justin Hunt’s MoodleBites for Developers Level 1 course. Justin is “the POODLL guy” – the smart Moodle Developer of the POODLL series of plugins (among others), especially good for language learning . Although the course covers much of the basics of Moodle development (by no means all) it also teaches the value of persistence – or should I say without persistence you will find it hard to complete. This is not the nature of the course material or the skill of the facilitator, rather it is the nature of the challenge. For a really quick but excellent overview of Moodle architecture, you can read Tim Hunt’s guide . As many people will tell you, learning by doing Moodle development is better and more effective than learning by reading about Moodle Development. In fact Moodle is built on the philosophy of social constructionism . It’s true that if you are not familiar with all of the above technologies you can learn as you go. A good source of basic knowledge is at the W3Schools website  which may help if you have some gaps. Yes, once you have knowledge it’s hard to to be specific on what others might need. I have an OO background so understanding an object and its methods is easier for me, not necessarily for some brought up in the procedural paradigm (not many of us left I appreciate). I take your point about Colllapsed Topics and I guess there is nothing you can’t learn if you really put your mind to it. However, bear in mind we are telling prospective participants that they need to put in 4/5 hours of study per week. I guess I was also referring to becoming a Moodle Developer in general rather than just the pre-requisites for the course (which are minimal for the Level 1 at least). It wasn’t my intention to put people off the course! 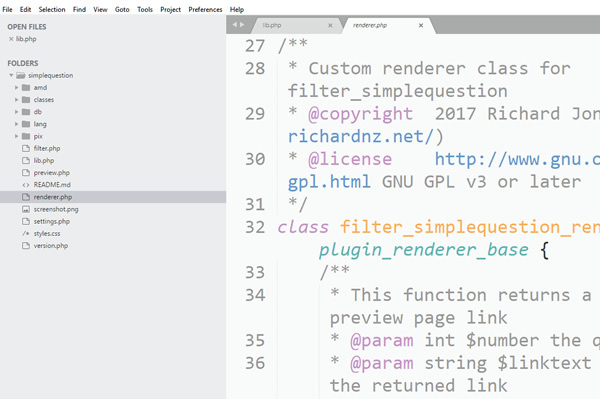 That’s such a great personal reflection on what it takes to start in Moodle development Richard ! I guess many people might think “It’s too hard for me” – but I think you’ve shown that although it’s not easy, it is possible, and anyone involved with Moodle, who has a programming type background, really can learn the Moodle approach, and requirements, and start on their journey.